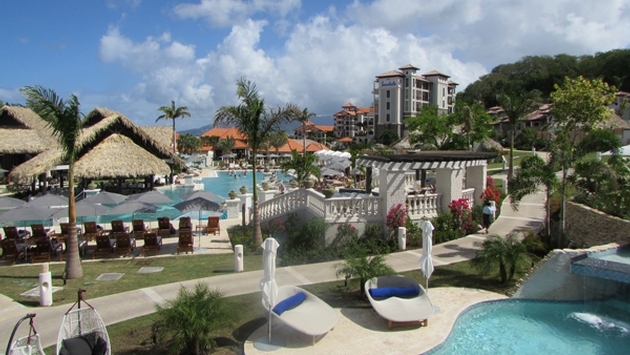 PHOTO: Sandals La Source Grenada Resort & Spa. Photo by Brian Major. Valentine’s Day has come and gone, but that doesn’t mean there isn’t a full complement of special offers for couples and all travelers seeking to escape freezing temperatures in warm-weather locales. The Sandals LaSource Grenada Resort & Spa, one of the Caribbean’s newest resorts, is offering savings throughout the spring. Guests who book minimum six-night stays in select room categories at the resort’s Italian Village through April 30, 2014 will receive bonuses based on when they book. Travelers who book from Feb. 10 to 28, 2014, receive $265, guests who book between March 1 and 31, 2014, save $190, and bookings made from April 1 to 30, 2014, earn savings of $125. The Bahamas’ Breezes Bahamas Resort & Spa is offering a “14 Days of Love” promotion featuring exclusive amenities, on-property credits and free nights. The offer is available to couples who book a resort wedding package between Feb. 14 and Feb. 28, 2014 for stays any time through Dec. 14, 2014. The promotion offers couples four nights in a deluxe ocean-view room, $140 in resort credits and a sweet treat deliverednightly. The package also features an “Endless Love” wedding including a wedding planner, marriage license, non-denominational minister, music, bridal bouquet and boutonniere, themed decor, sparkling wine, a classic wedding cake, four guest passes, a framed photo, an online registry website, and wedding keepsakes. Love is in the air across the entirety of the Barbados, as the destination’s “Barbados Island Inclusive” offers travelers “free spending money” based on vacationers’ length of stay. The money may be used at participating Barbados attractions and restaurants. The offer is available for travel from May 1 to Dec. 19, 2014. Trips must be booked from February 14 to March 31, 2014. Guests who stay five nights will receive $150 per person; guests who stay seven nights or longer will receive $200 per person based on a maximum of two persons per room. Vouchers will be distributed to guests upon hotel check-in.